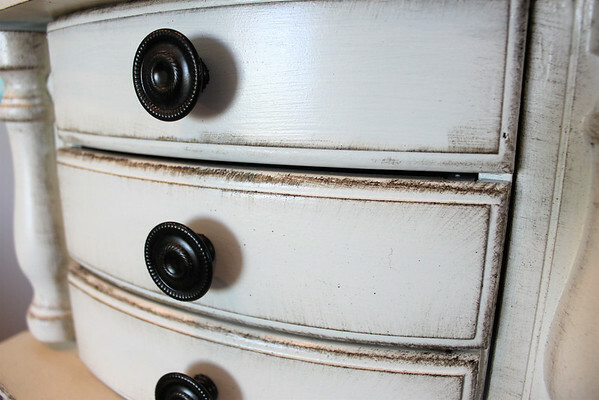 Jewelry Armoire Makeover Mama Say What?! | Mama Say What?! One day, I decided I needed a little armoire to hold my jewelry because the belt rack I had my necklaces hanging on just wasn’t working anymore. My toddler enjoys pulling them down, and everyday I would find a new set of beads and broken necklace pieces scattered around my closet floor. You’ve gotta love Craigslist! 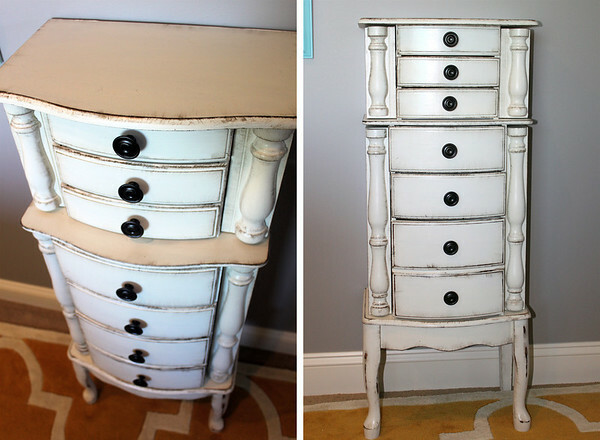 I found this beauty for a steal, and knew right away that a painting makeover was in store. I just loved the legs and all the curves this piece had. I decided I was going to try out some DIY chalk paint, since I didn’t want to bother with sanding this entire thing down. I had an old can of white paint that I mixed with some tile grout and went to town on the armoire (after removing all the hardware of course). I was amazed at how well the paint stuck to the smooth surface without any sanding, but obviously one coat wasn’t going to cut it. 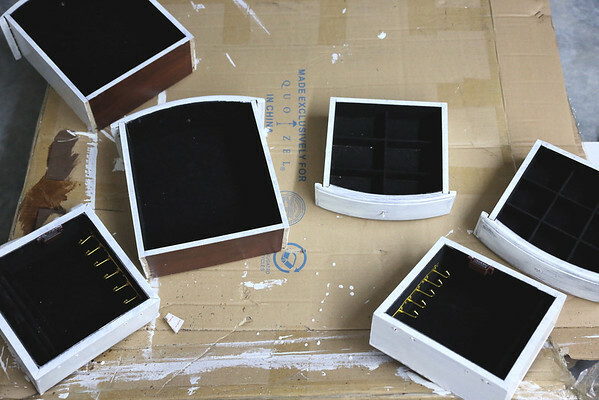 I did use a small sanding block in between coats to ensure a smooth surface. After two coats, I was satisfied with the coverage and decided to use a little bit of dark wax to make the edges and grooves ‘pop’ out a bit. I got a VERY SMALL amount on my dry paint brush and dabbed it on the corners and edges. If I got too much anywhere, I just used a towel with some clear wax on it to wipe it off and start again. I also scuffed up the corners of the legs with a sanding block to add a little bit more of an effect to them. To finish it off, I brushed on two coats of clear Polyacryclic. I had a big can of semi-gloss sitting in the garage, so I just used that. I wished I wouldn’t have used a glossy top-coat because it made it a little too shiny for my liking, but oh well. It still works! For the hardware, I spray painted it all with an oil rubbed bronze and screwed everything back together. I have to say, the only time consuming part was un-scrwewing and then screwing back on all the hardware. Very tedious, but it had to be done! Perfect for either my bathroom or bedroom— not sure where I will keep it just yet! I guess we will have to see where my son is least likely to get to it now! Added by Heidi C. on May 25, 2013. 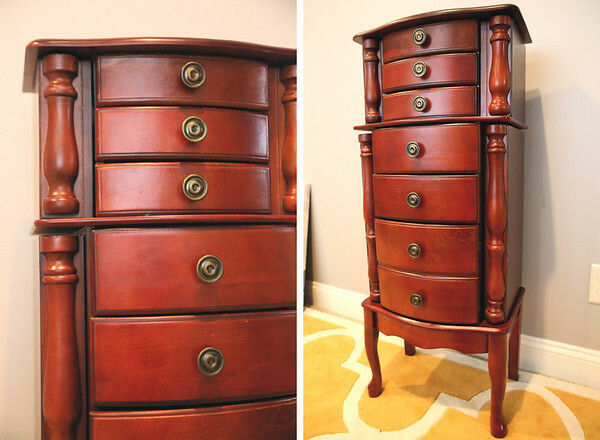 I love this jewelry armoire! I’m getting ready to re-do my own! 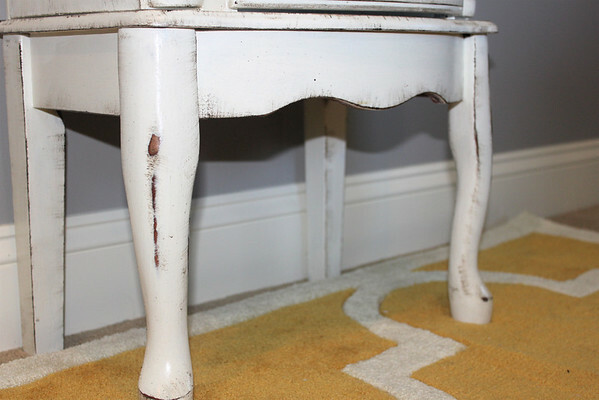 Did you use the Annie Sloan dark wax? Or another brand? I actually used a brand called Fiddes and Sons. The color is called Jacobean. I believe It is probably very similar to the Annie Sloan dark wax, although I have never used it. 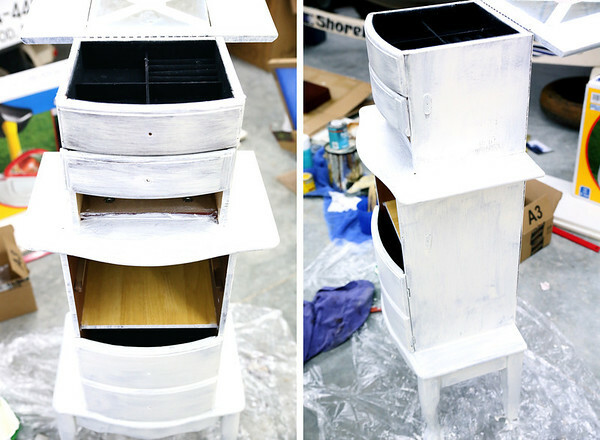 Pingback: DIY Sofa Table Makeover Mama Say What?! | Mama Say What? !